When I first began to learn the art of stained glass, I took a series of six lessons in which I had to make a 13-piece hummingbird. I finished after the first lesson! When I asked my teacher what I should do in the remaining five lessons, he replied that he had nothing planned because students always took six lessons to finish the project. With nothing else to do, I decided to draw my first stained glass pattern. My teacher advised me to draw a modest pattern of around 30 to 40 pieces, with mostly straight lines. Those are easier to work with than curves, he explained, and as I gained more experience I could think about including some curved lines. "No way!" I thought to myself. 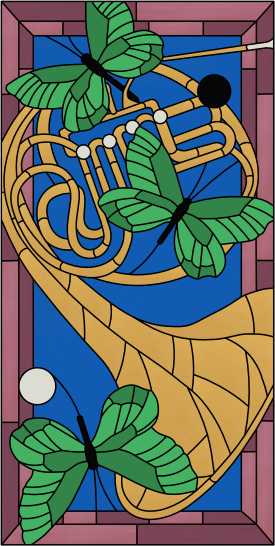 So instead I drew a big stained glass pattern with many curved lines: a French horn with butterflies. (Can you have more curves than that?) The result was a pattern of 24" x 48" with 259 pieces named "Cozy Afternoon." I was a little afraid to begin the project, but felt that it would come out well if I worked slowly and carefully. I wondered why a design of 259 pieces would be harder than one of 13 pieces. It seemed like it would simply take longer to finish, but would not really be more difficult. It took about a month to complete, and making this panel taught me not to be afraid of big stained glass projects! After I finished that project, I showed the result to my teacher. He was impressed, and asked me if I intended to do stained glass for hobby or to work full time. I told him that I wanted to create modern stained glass windows for the rest of my life. Such youthful energy and idealism! Now twenty years later, I have designed about 800 stained glass panels, and have built about 300 of them myself. Most of those had more than 1500 pieces each. For this Design of the Month, I'm offering that first pattern done two decades ago. When I look at it now, I see lines that I wouldn't draw nowadays, but I think it was a good first pattern for a beginner. I hope you have as much fun building it as I did! 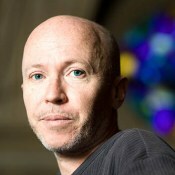 Jean Beaulieu, artist and creator, painter for over 30 years, has exhibited in a dozen cities worldwide. He started doing stained glass twenty years ago and decided to use the glasswork in the service of a cause dear to him: troubled youth. He is the founder of the MargiArt project which for the last ten years has provided stained glass instruction for these young people. This project inspired him to found les Ateliers Art-Go, an organization that oversees community groups in Québec City, Trois-Rivières, Montréal and eventually Vancouver and Toronto. You may visit his website or send him an email.